Inaugurating the second annual HR summit of IIM Kashipur, Dr.Gautam Sinha, Director- IIM Kashipur emphasized on the fact that HR nowadays is being at forefront at the Corporate Strategy. This year the summit was organized in national capital, New Delhi. SAMANVAYA, according to Mr. Sinha is the answer to the question on how the manage the most volatile capital in an organization: the human capital. SAMANVAYA is an annual HR Summit organized by IIM Kashipur to impress upon the fact that HR recently has acquired a strategic position in navigating an organization through testing times and that managing the human capital is equally important for an organization to succeed. The summit witnessed the confluence of the Industry heads and eminent business leaders from prominent companies spread across diversified sectors like steel, power and software. All the delegates agreed upon the common point that hierarchy has become flatter and that people have become the barometer for success. Reflecting on the HR in a network organization Mr. Venkatnarayanan, President HR, IT & Education, Rane Holdings Limited said that talent management, talent retention, high performance culture and effective Training and Development are the four major challenges of HR. Mr. Ranjan Bandhopadhyay, Global HR Head ,BPO Services TCS was of the view that managing the huge amount of data through better security management is the need of the hour and TCS is doing its every bit to make sure client data is secure. Mr. Piyush Dutt, Chief HR officer, TPG Sales said that HR nowadays contributes substantially to the top line and bottom line of the company which is gradually becoming a barometer for the HR performance of an organization. Mr. Manmohan Bhutani, Vice President, People & Operations, Fiserv Global Services said today’s business world is all about people and the war is for talent. Hence business strategy and people strategy has to be merged. He credited the IT/ITES companies in bringing this competitive nature to Indian corporate culture. IIM Kashipur is the new entrant in the league of IIM’s and has commenced operations from July 2011. The institute offers its flagship two years Post Graduate Program in management (PGPM). The institute is set up with the objective of providing quality management education while sensitizing students towards the need of the society. Operations Club conducted its second session on 22nd August 2012. The session was facilitated by Mr Kapil Vaish and Mr Avinash Saha, students of PGP’11-13 and majoring in operations. The session was attended by a bunch of operations enthusiast from PGP’12-14 batch. The session focused on giving a bird’s eye view of all the components of operations from an industrial perspective. An introduction to Mix Integer Linear Programming Model was also given to the attendees. The session started with understanding the major components of Operations at a high level. The entire hierarchy and architecture of Supply Chain management was discussed. Enthusiasts were introduced to the concept of forecasting the need, master production schedule, material resource planning, capacity planning. The chronology of events was discussed in detail starting from the vendor finalization for supply of raw materials to the distribution of the final product to warehouses and retailers. Thereafter, an introduction to Mix Integer Linear Programming model was made wherein members solved a sample optimization problem in excel using Solver. The example threw light on how the constraints are identified for a given problem and entered into the solver to achieve an optimum solution. The session helped the attendees in understanding what exactly an operation is and to a high extent exposed them to the kind of challenges that entail this area of management. Nainitaal, Almora, a perfect visual treat awaits you here. Interaction with Industry Expert: Mr. Faisal Siddiqui, Vice President, HealthCare division at Technopak Advisors Pvt Ltd.
Mr. Faisal Siddiqui, Vice President of Healthcare division at Technopak Advisors Pvt Ltd., visited IIM Kashipur campus on 13th August 2012 as a part of the rolling guest lecture series. Technopak is a leading organization providing advisory solutions in setting up of companies in the field of Textile, Retail, Healthcare and Food & Agriculture. Mr. Faisal did his masters in business from University of Wisconsin. 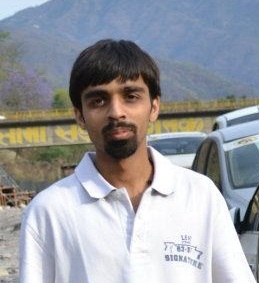 He has also worked at key positions in Apollo hospital group, Fortis Healthcare, GE Health Care and Siemens. hat lie in this sector for years to come and the qualities that MBA graduates should possess to excel in the field of healthcare consulting. The session ended with Mr. Faisal’s candid conversation with the students where he shared his personal experiences in the healthcare sector. The session was very informative and increased awareness among the students about the bright prospects in this sector. Interaction with Industry Expert: Mr. Amol Maheshwari, Head – Corporate Business, North and Central India at Bajaj Allianz Life Insurance Company. owth for this sector. He touched upon the recent downturn faced by the industry due to regulations and restrictions imposed on FDI in the sector. Later on, he elucidated the differences in the sales process for Individual buyers and Institutional buyers. Advertising strategies for Insurance schemes such as appealing to emotions of the buyer were discussed through different ad campaigns of financial institutions. Through this session, the students were acquainted with the sales and marketing strategies used in the Insurance sector and also got exposed to the various opportunities available to them in the Insurance sector. In the 17th century, the Japanese developed a method of technical analysis to analyse the price of rice contracts. This technique is called candlestick charting. Steven Nison is credited with popularizing candlestick charting and has become recognized as the leading expert on their interpretation. 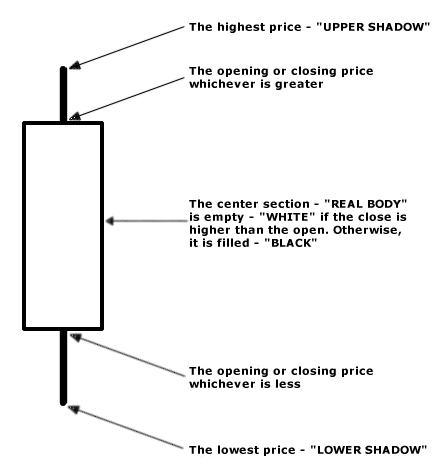 Candlestick charts display the open, high, low, and closing prices in a format similar to a modern-day bar-chart, but in a manner that extenuates the relationship between the opening and closing prices. Candlestick charts are simply a new way of looking at prices, they don’t involve any calculations. Each candlestick represents one period (e.g., day) of data. The figure below displays the elements of a candlestick. Candlestick charts are flexible, because candlestick charts can be used alone or in combination with other technical analysis techniques. A significant advantage attributed to candlestick charting techniques is that these techniques can be used in addition to, not instead of, other technical tools. In fact this system is superior to other technical tools. Candlestick charting techniques provide an extra dimension of analysis. As with all charting methods, candlestick chart patterns are subject to interpretation by the user. This is a three-candlestick formation that signals a major bottom. It is composed of a first long black body, a second small real body, white or black, gapping lower to form a star. These two candlesticks define a basic star pattern. The third is a white candlestick that closes well into the first session’s black real body. Third candlestick shows that the market turned bullish now. Market is characterized by downtrend. We see a long black candlestick in the first day. Then we see a small body on the second day gapping in the direction of the previous downtrend. Finally we see a white candlestick on the third day. We see the black body in a falling market suggesting that the bears are in command. Then a small real body appears implying the incapacity of sellers to drive the market lower. The strong white body of third day proves that bulls have taken over. 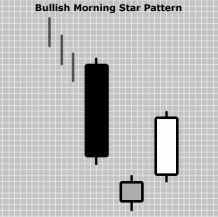 An ideal Bullish Morning Star Pattern preferably has a gap before and after the middle candlestick. The second gap is rare, but lack of it does not take away from the power of this formation. The stars may be more than one, two or even three. The colour of the star and its gaps are not important. The pattern is characterized by a long white candlestick followed by three small bodies in three consecutive days. The small bodies represent some resistance to previous uptrend and they may even trace a short downtrend. These three reaction days usually have black candlesticks but the bodies remain within the high and low range of the first day’s white candlestick. The pattern is completed by a white candlestick on the fifth day, opening above the close of the previous day and closing at a new high. The small downtrend between the two long white candlesticks represents a break during the uptrend. The upward trend then resumes and continues. Market is characterized by uptrend. We see a long white candlestick in the first day. Then we see small real bodies defining a brief downtrend but staying within the range of the first day on the second, third and fourth days. Finally we see a long white candlestick on the fifth day opening above the close of the previous day and also closing at a new high. 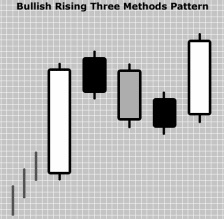 The Bullish Rising Three Methods Pattern typically represents a rest in the market action. This may be used to add new positions by longs. The pattern is the reflection of doubts about the ability of the trend to continue. This doubt may increase because of small-range reaction days. However, given the fact that a new low cannot be made, the bullishness is resumed and new highs are set quickly. The high-low range includes the shadows. The reliability of this pattern is very high, but a confirmation in the form of a white candlestick with a higher close or a gap-up still is suggested. The “Squared root formula” for steady state demand for economic lot size is well known. The calculation is predicated upon balancing ordering cost (Setup Cost) and holding cost. But when the assumption of steady state demand rate is dropped i.e. when demand for the future is known but are not constant and when setup cost and holding cost changes with periods then square root formula for the EOQ not necessary give the optimal result in deciding the lot size. Here I have applied the algorithm on a hypothetical data just to illustrate you how excel model can be very easy to come up with dynamic lot sizing method. When we apply the objective function and constraints in excel solver we get the optimal solution of lot size per period. An example is given in the link below to illustrate the process. Hope it would be helpful. 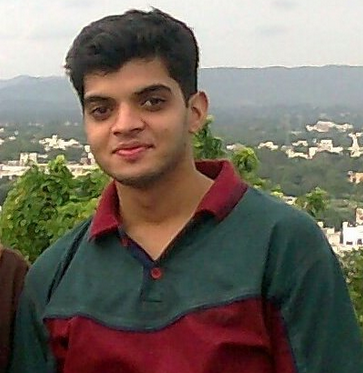 PGP ’11 student, Pulkit Taluja, recently cleared the CFA Level 2 Exam. He shared his insight on need of CFA and approach that is required to clear it. What is CFA Program and what is its scope in today’s context? CFA Program is a globally recognized program which equips one with comprehensive knowledge in the field of investment analysis and portfolio management. CFA Program consists of 3 levels (exams) and passing all three would close you to the CFA Charter which additionally requires 4 years of investment related work experience. While CFA Level 1 focuses on building the basics in all areas related to finance, Level 2 focuses on valuation and Level 3 on portfolio management. In today’s context CFA is a very good course from the perspective of learning and building your credibility in the eyes of prospective recruiters. Who should pursue this programme? How does CFA add value to a regular MBA? If you look at CFA Charter, it is specifically designed for people who want to enter portfolio management/ investment analysis. It is not delve deep into other fields of finance like investment banking, commercial banking etc. However, for someone who doesn’t have any prior knowledge in finance and wants to enter the field, CFA Level 1 is a very good course to start with. Level 1 curriculum covers basics of a wide variety of areas like quant, economics, fixed income, equity, derivatives, corporate finance, portfolio management etc. It provides an organized way of learning the basics which otherwise if we try to learn in a haphazard manner takes a lot of time. In Indian context, for a person entering MBA wanting to specialize in finance, pursuing CFA becomes even more important especially if one is from a non-commerce background. It is because of two reasons. One is that an MBA courses cover topics in a very broad way. Till the students complete their first year, they are taught only about 3-4 course in finance. They are not exposed to the world of complex financial instruments, derivatives, their valuation etc. There is a wide gap between what’s covered and what one is required to know. The CFA curriculum fits into that gap very well. Therefore for those who wish to pursue finance in MBA, they apply for Level 1 exams as early as possible. It clearly gives an added advantage over someone who is only exposed to courses that are a part of curriculum. The advantage of an MBA is that the learning is case-based unlike CFA which is predominantly theory based especially Level 1 and Level 2. Thus both the courses complement each other very well. Do you think the popularity of the CFA is growing? If yes, what advantage do students have in placements if there are already many people having cleared CFA exams? The popularity of CFA is growing very fast in India especially amongst MBA students. Since most of the MBAs come from a non- finance background, it provides them an easy way to enhance their resume and express their interest to prospective recruiters. In good B-Schools, where competition is tough for both summer and final placements, taking CFA Level 1 exam has become a necessity for someone looking to specialize in finance. In the process, there are a lot of students who have cleared CFA L1 exam when the applications are sent to recruiter which doesn’t make it a differentiating factor. CFA L2 to some extent may be a differentiating factor. As per my conversation with some recruiters and industry experts, what they look for is the application of what you have learned in the program. You could regularly publish equity research reports, start your own investment fund, provide financial consulting or engage in a live project with some corporate. That would be much more valuable even if you don’t pursue CFA but for getting to that level you need the understanding of concepts which are provided by the CFA curriculum. How should candidates prepare for CFA considering academic rigor in MBA? There is only one answer to this question- regular hard work and practice. Given the academic rigor and fast paced life in MBA, my suggestion is to start early and study a little every day. Also, many people recommend studying from reference books other than those provided by CFA as they contain much less content and can be finished fast. But according to me, they won’t provide you with as much learning and should be referred to if you have very little time for preparation. Apart from that, keep some leeway for your project submissions, mid-term and end-term exams and plan accordingly. Finally, the idea must be to learn and not just pass the exam as during a recruitment interview you would be expected to know what was there in the curriculum.